SCIOPTA Systems AG a technolgy leader in system software for safe and reliable embedded systems, today announced the immediate availability of its real-time operating system targeting Luminary’s Stellaris® microcontrollers, built on ARM® Cortex™-M3 technology. The SCIOPTA ARM Cortex RTOS is written in highly optimized assembler and specifically tuned for the Luminary Stellaris® microcontrollers (MCUs). This results in a very high performance and a low memory footprint. SCIOPTA is fully dynamic. All system resources such as modules, processes and message memory pools can be created and killed during run-time. Beside the fast Real-Time Kernel there is IPS (Internet Protocols, TCP/IP), IPS Applications (Web Server, DHCP, DNS, SMTP, Telnet, TFTP etc. ), SFATFS (FAT File System), SFFS (Flash File System), USB Host and Device support, embedded GUI graphics support and the DRUID System Level Debugger available. SCIOPTA is royalty free and supports actually the C/C++ compilers and environments from GNU GCC and IAR Systems. A precompiled version of GCC is included on the SCIOPTA CD. Luminary Micro, Inc. designs, markets, and sells ARM® Cortex™-M3-based microcontrollers (MCUs). 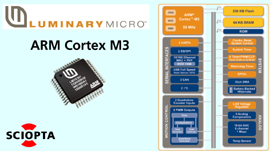 As ARM's lead partner for Cortex-M3 technology, Luminary Micro delivers the world's first silicon implementation of the Cortex-M3 processor, providing 32-bit performance at 8-/16-bit cost. Luminary Micro's award-winning Stellaris family of microcontrollers incorporates the Cortex-M3 MCU core running up to 50 MHz, embedded flash and SRAM, a 32-ch DMA, a low drop-out voltage regulator, battery backed low-power hibernation capability, integrated brown-out reset and power-on reset functions, analog comparators, 10-bit ADC, GPIOs, and watchdog and general purpose timers. The family also integrates several serial interfaces, including 10/100 Ethernet MAC+PHY, CAN, USB On-The-Go, USB Host/Device, SSI/SPI, UARTs, and I2C. Finally, the Stellaris family features peripherals designed specifically for intense industrial motor control, including motion control PWMs and quadrature encoder inputs. With every peripheral provided directly to the pins without feature multiplexing, the Stellaris family is favorably positioned for cost-conscious applications requiring significant control processing and connectivity capabilities, including motion control, monitoring (remote, fire/security, etc. ), HVAC and building controls, power and energy monitoring and conversion, network appliances and switches, factory automation, electronic point-of-sale machines, test and measurement equipment, medical instrumentation, and gaming equipment. SCIOPTA Systems AG is announcing the immediate availability of the SCIOPTA Real-Time Operating Systems for the Freescale i.MX27 Applications Processor. The SCIOPTA i.MX27 RTOS is written in highly optimized assembler and specifically tuned for the i.MX27 processor. This results in a very high performance and a low memory footprint. Beside the fast Real-Time Kernel there is IPS (Internet Protocols, TCP/IP), IPS Applications (Web Server, DHCP, DNS, SMTP, Telnet, TFTP etc. ), SFFS (Flash File Systems), USB support, embedded GUI graphics support and the DRUID System Level Debugger available. In response to the needs of design engineers tasked with pushing the performance envelope, packing in a lot of connectivity options and providing robust security in mobile device designs, Freescale presents the i.MX27 multimedia applications processor. Derived from the popular i.MX21 processor and based on the ARM926EJ-S™ core, the i.MX27 processor adds an H.264 D1 hardware codec for high-resolution video processing, an Ethernet 10/100 MAC, security, plug-and-play connectivity and more power management features. This rich feature set makes it an excellent choice for video- and voice-over-IP (V2IP) cordless and mobile phones, intelligent remote controls, point-of-sale terminals and many other wireless applications. The i.MX27 multimedia applications processor is architected with Freescale’s Smart Speed™ technology, an intelligent integrative approach that uses hardware accelerators to offload the CPU and a crossbar switch to bring parallelism to the system. The result is a processor that performs like a much higher MHz device, but conserves power for long, long battery life. Internal connectivity includes: 10 and 100 Mbps Ethernet/IEEE® 802.3MAC, USB OTG high speed, host x 2, 3 x MMC/SD, Memory Stick-Pro™, PCMCIA/CF, ATA-6 (HDD) interface, Audio MUX, IrDA, keypad, 1-wire and Configurable SPI x 3, SSI/I2S x 2, UART x 6. SCIOPTA Systems AG is announcing the immediate availability of the SCIOPTA Real-Time Operating Systems for the AMCC PowerPC 405 and 440 families. The SCIOPTA PPC400 RTOS is written in highly optimized assembler and specifically tuned for the PowerPC 405 and 440 processors. This results in a very high performance and a low memory footprint. SCIOPTA is royalty free and supports actually the C/C++ compilers and environments from GNU GCC and Windriver/DIAB. A precompiled version of GCC is included on the SCIOPTA CD. The PowerPC 440EP embedded processor offers exceptional performance, design flexibility, and robust features geared to demanding Imaging, industrial control, networking and other embedded applications. With speeds of up to 533MHz, PowerPC Book E Architecture, and a rich peripheral mix, PowerPC 440EP processors are ideally suited for a wide range of high-performance applications. The AMCC PowerPC 405EP 32-bit RISC processor is designed to provide a flexible, fast time-to-market hardware solution to satisfy the demands of high- performance embedded applications. Implemented in the scalable PowerPC Architecture™, the 405EP processor maintains code compatibility with other PowerPC processors for ease in migration and fast time-to-market. An optimized balance of performance, low power, and features makes the PowerPC 405EP an ideal solution for communication, data storage, and pervasive computing applications. The 405EP processor supports speeds of up to 333MHz and incorporates a rich mix of features, such as two Ethernet MACs, a PCI interface, an SDRAM Controller, and other on-chip peripherals. In addition, power management features, a small form factor, and low power consumption make the AMCC 405 processor family an ideal platform for applications ranging from networking to video. IAR Systems and SCIOPTA Systems have entered into an agreement on a joint solution of RTOS and development tools to address the needs of customers building safety-critical applications, including those that have a need for IEC 61508 certification. Under the agreement between IAR Systems and SCIOPTA Systems each party will sell and support the combination of the SCIOPTA RTOSa pre-emptive multi-tasking high performance real-time kerneland IAR Embedded Workbench, which are both well adapted for safety-critical applications. Many different embedded software applications can be seen as safety-critical, including those used in automotive, rail, avionics, oil refineries, chemical processing plants, nuclear power plants and medical electronics. As these software applications become increasingly complex, the costs associated with the development of embedded software in a safety environment also increase. Independently of whether or not the safety-critical application requires conformance to a certain standard such as IEC 61508, the choice of the right software development tools and the right RTOS will have a significant impact on the life cycle cost of the software application. SCIOPTA also has a long-standing association with safety-critical applications: its pre-emptive multi-tasking high performance real-time kernel includes many built-in safety features that make it particularly suited to high integrity operation, including direct message passing. SCIOPTA is currently in the final stages of certification by TÜV to the IEC 61508 standard at Safety Integrity Level 3 (SIL3), a qualification that makes it an even more attractive option for developing safety-critical applications. “We particularly welcome this new partnership between IAR Systems and SCIOPTA. I have experience of working on customer projects with both of these companies, and such a close cooperation combined with the benefit of a ‘one-stop shop’ will clearly be a major advantage to customers,” said Rainer Faller of Exida, a US company specializing in the safety and reliability of automation systems.